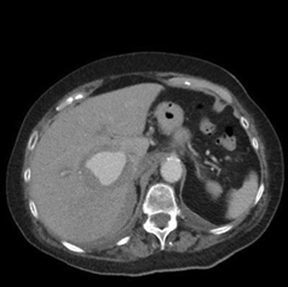 An 81-year-old Caucasian woman presented to the emergency department (ED) for evaluation of abdominal pain. She reported sharp epigastric pain that radiated to her back, along with intermittent abdominal pain for 5 days. She stated the pain was 10 out of 10 in severity and denied any other symptoms. Upon physical examination, the patient had superior epigastric abdominal tenderness to palpation with guarding. A computed tomography angiogram (CTA) of the thorax, abdomen, and pelvis was performed for concerns of an aortic dissection. This demonstrated a giant pseudoaneurysm measuring 10 cm x 4.8 cm within the gastroduodenal artery distribution with associated active extravasation secondary to pancreatitis. The CTA demonstrated a multi-lobulated, large, sub-hepatic pseudoaneurysm measuring 10 cm x 4.8 cm arising from the gastroduodenal artery/right gastroepiploic artery distribution with adjacent active extravasation (Figure 1). These findings were secondary to pancreatitis. Interventional radiology was consulted for further evaluation. Catheter-directed angiography of the gastroduodenal artery demonstrated a giant pseudoaneurysm with active extravasation arising from the right gastroepiploic artery with fistulous communication with the inferior vena cava (IVC) (Figure 2). 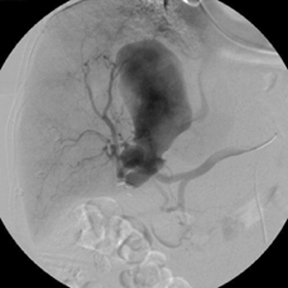 Postembolization angiogram of the common hepatic artery demonstrated resolution of the pseudoaneurysm and active extravasation (Figure 2). Computed tomography angiography can help make a diagnosis; however, definitive diagnosis must be made with catheter angiography.5 Treatment options include surgery and endovascular procedures. The appropriate treatment option depends on measurements, whether the pseudoaneurysm has ruptured, and vital signs of the patient. In our patient, hemodynamic stability was assessed. Together with the initial CTA and diagnosis, we felt that coil embolization was the best treatment option, given the size and high probability of frank rupture. Also, treatment with liquid embolic or glue could have resulted in non-target embolization of the pulmonary arteries through the fistula with the IVC. Endovascular treatment with coil embolization not only resolved the giant pseudoaneurysm, but prevented a more invasive treatment option such as laparotomy. 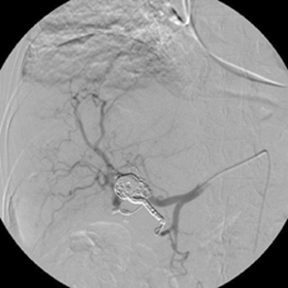 Right gastroepiploic artery pseudoaneurysms are rare, and even rarer in the development of a venous fistula. Nonetheless, it is a complication of pancreatitis. 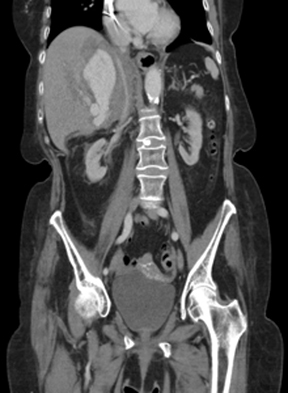 Its characteristic presentation of vague abdominal pain requires further investigation with CT imaging. Treatment should promptly follow diagnosis due to the high risk of rupture. Depending on size, rupture, and physical presentation of the patient, several treatment options are available. Coil embolization of the giant pseudoaneurysm was successful in this patient with no further complications. Stanley JC, Thompson NM, Fry WJ. Splanchnic artery aneurysms. Archives of Surgery 1970; 838-839. 101:689-97. Stanley JC, Whitehouse Jr WM. Splanchnic artery aneurysms. Journal of Vascular surgery 1984; 798-813. Pattanshetty D, Bhat P. Left gastric artery pseudoaneurysm as a sequelae of chronic pancreatitis: recognizing a life-threatening complication. Central European Journal of Medicine. 2014; 9(3) 370-373. doi: 10.2478/s11536-013-0302-2. Jauhari A, Shrivastava, A, Soni RK, Darbari, A. pseudoaneurysm of aberrant right gastroepiploic artery mimicking pseudocyst of pancreas – a rare case report. Journal of Clinical and Diagnostic Research 2017; 11(4) 9-10. doi: 10.7860/JCDR/2017/25314.9651. Murakami Y, Saito H, Shimizu S, Kono Y, Kurodo H, et al. A Case of unruptured right gastroepiploic artery aneurysm successfully resected by laparoscopic surgery. Yonago Acta Medica 2017; 60(1) 56-58. Stenz J, Patel D, Rodemoyer A, Zarour CC. Giant right gastroepiploic artery pseudoaneurysm with an IVC fistula. Appl Radiol. 2018;47(11):32-33. Prepared by Dr. Stenz while an Interventional Radiologist and Drs. Patel and Rodemoyer while Diagnostic Radiology Residents at McLaren Health Care Corp. in Pontiac, MI; and Mr. Zarour while a Medical Student at the University of Medicine and Health Science, St. Kitts, and serving a clinical clerkship at McLaren Oakland Hospital in Pontiac, MI.